Kevin Feige has teased that something really bad happens in the first five minutes of Avengers: Infinity War. The Avengers: Infinity War trailer dropped a few weeks ago and we now know a lot more about the movie than you might think. I should warn you that this post contains potentially MAJOR SPOILERS. You have been warned. If you’re still with us, here are the most likely ways Thanos will show himself to be the biggest and baddest villain in the history of the MCEU in the first five minutes of Infinity War:. The movie probably begins with the destruction of Xandar. Hands down, this is the most likely scenario. You remember Xandar, that lovely little planet the Guardians of the Galaxy saved in their first film? At the end of the Guardians of the Galaxy, the Guardians gave the purple Power Stone that had been in the Orb to Nova Corps, who placed it in a vault in their headquarters on Xandar. We’re pretty sure that Xandar is toast because we can’t imagine the Nova Corps giving up the Power Stone without a fight, yet the official trailer shows Thanos dropping the Space Stone from the Tesseract into the Infinity Gauntlet… and he already has the Power Stone! So, yeah… It’s probably the destruction of Xandar. Alternately, the film could skip over the destruction of Xandar and go straight for what caused this scene where someone is walking over dead Asgardian bodies. I initially thought that the boots belonged to Loki, but since then Tom Hiddleston himself has identified them as belonging to Ebony Maw, a member of Thanos’ Black Guard. Of course, Loki is a Trickster so who can say if he’s telling us the truth or trying to throw us off the scent? In any case, since the trailer already gave away the fact that Thanos already possesses the Power Stone, the film might opt to go straight to his acquisition of the blue Space Stone contained within the Tesseract. The trailer does show Loki stretching out his hand to give someone (likely Thanos himself or Ebony Maw) the Tesseract. Loki eyeballed the Tesseract at the end of Thor: Ragnarok and the trailer confirms the prevailing theory that he stole it. The mid-credits scene in Thor: Ragnarok shows Thor and Loki duscussing their plans to relocate the Asgardian refugees aboard the Statesman (the starship they stole from the Grandmaster) to Earth. Thor assures Loki that everything will be fine, but just then a massive ship dwarfs the Statesman. This has been identified as Sanctuary II, Thanos’ flagship. The violent boarding of the Statesman and slaughter of the Asgardian refugees could be the really bad thing that Feige promised would happen in the first five minutes. The D23 trailer showed Thor being flung into space after an explosion. The ship looks like a Chittauri Command Center, like the control ship Tony Stark nukes in space at the end of The Avengers. In fact, I’m betting that footage from The Avengers was placed in this teaser as a stand-in for Thanos’ Sanctuary II that appears in the mid-credits scene of Thor: Ragnarok to throw fan theories off a bit. I mean, the clip is identical to the one in The Avengers. Identical. The next scene shows Thor floating in space. He eventually gets caught on the Milano’s windshield and is taken aboard by the Guardians of the Galaxy. Another brief clip from the Comic Con trailer shows Thanos holding Thor’s head in his meaty purple palm, forcing him to watch something. It seems most probable that he’s watching the destruction of the Statesman, possibly with Loki still onboard. Thanos granted Loki the scepter that housed the Mind Stone and sent him to Earth to capture the Tesseract and conquer Earth. Thanos even supplied him an army in the form of the Chitaurii, but Loki failed spectacularly. 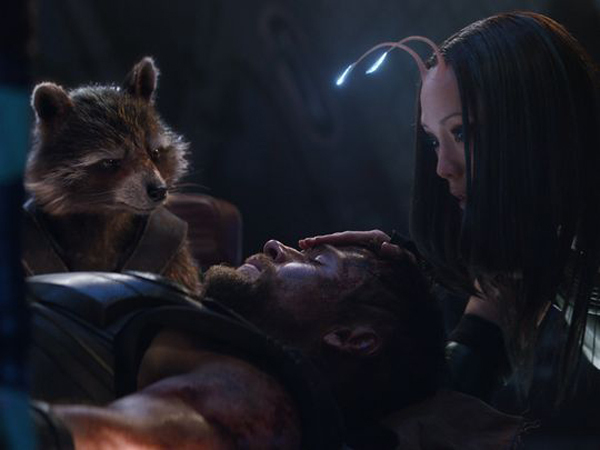 Some have speculated that Loki weasels his way into becoming Thanos’ adviser, and that could be true, but if he dies right after the slaughter of the Asgardians… well, that would definitely be bad. There is another possibility as well. The movie could begin at the point where Peter Parker’s Spidey sense go off and straight to a fight with Thanos in New York as a flashforward before we get back to how it all started. In the official trailer, Thanos manhandles Spider-man. We are also given a few scenes where Tony Stark appears grief-stricken. He has no armor on. His hand is bloodied and he looks like he’s grief stricken. The background has the orange hue of flame. This still from the D23 trailer provides some context. I believe Stark is grieving the death of Spider-Man. It would certainly explain this scene in the official trailer where Tony Stark looks up and peers over his shoulder, looking like he’s about to go off. This appears to take place immediately after the scene where he has blood on his hands. I think we can all agree that Vision dies in this film. He has an Infinity Stone stuck right in the middle of his forehead. It gave him life. We are hard-pressed to imagine how he could survive its removal. Thanos isn’t likely to be delicate. In deed, the official trailer shows the Mind Stone is being torn from Vision’s forehead by Corvius Glaive, another member of Thanos’ Black Order. As for that other scene where Vision looks decidedly more human in a romantic scene with the Scarlet Witch… you’re not gonna like this. The Scarlet Witch is going to lose her mind at the death of Vision. That human-looking Vision is a construct. As are the twin children they have, if a certain casting call is any indication. There are rumors that she will resurrect Quicksilver and Crossbones in her illusion. In the Avengers Disassembled comic series, she created a construct of the Red Skull, complete with Nazi soldiers, to attack the Avengers. Doctor Strange was required to subdue her with the Eye of Agamotto. If a similar plot occurs, this scene will have to take place before Strange is attacked by Ebony Maw, who is after the Time Stone contained in the Eye of Agamotto, if this set photo is any indication. I don’t think that Vision is likely to die in the first five minutes of the film, but, again, if the movie begins further in and then backtracks to bring us up to the present, it’s at least possible that Marvel will get that one out of the way. So there you have it. The five most likely candidates for Thanos’ big, bad move in the first five minutes of Infinity War. My money’s on Xandar. What do you think?